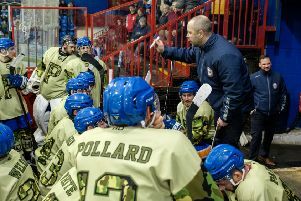 Phantoms coach Slava Koulikov insists his team cannot afford to let their best performance of the season go to waste. Koulikov dished out the plaudits in the wake of a 2-0 triumph over Hull in the English Premier League last Sunday. It was a victory which preserved the city club’s place in the top half of the standings and Koulikov now wants his fifth-placed men to make further progress during a run of four games against struggling sides. They begin this weekend with a Saturday visit to next-to-bottom Bracknell (6pm) followed by a Sunday date against basement boys Manchester (5.30pm). Phantoms then host Bracknell on the next two successive Sundays (December 4 and 11). “We’ve had a lot of good results this season, but last Sunday against Hull really stood out,” said Koulikov. “We had to fight against a lot of things – not just good opposition – and for many different reasons it was the best performance I’ve seen from my team. “Every single guy from my netminder forward was outstanding. It is impossible to single any individuals out after a complete showing like that. “We managed to shut out the highest-scoring team in the league and I was always confident we could find the net ourselves. “I was a little disappointed to come away from Guildford with nothing the previous night, but we addressed the reasons behind that defeat and my guys gave me an outstanding response. “If we can repeat that sort of display we put in against Hull on a consistent basis, there are not many teams who will beat us. “We have come through the last two weekends against tough opponents with a 50 per-cent win ratio, and the challenge now is to better that with the games we have coming up. Phantoms can take the wonderful winning streak against Bracknell to 20 games with victory at The Hive on Saturday. They have won all six clashes with the Berkshire side in the last three seasons and also triumphed there last month. They will then entertain Manchester for the first time this season. The visit of the Phoenix provides a Planet Ice return for two members of Phantoms’ play-off winning squad of 2013/14 – Edgars Bebris and Greg Pick. Koulikov has fitness concerns over forwards James Archer and Marc Levers, who both missed the success against Hull last Sunday.